Problems are mounting in the Masaibu project – Can Sam Harris solve them all or will she have to choose? Geologist Sam Harris gets a call in the middle of the night that takes her to the Masaibu project in eastern Lumbono, in West Africa. The project is collapsing under the weight of corruption and chicanery engendered by management, both in country and back on the main company board. Sam will have to navigate murky waters to get it back on course, not helped by interference from people who want her to fail. When poachers invade the elephant sanctuary next door, her problems multiply. Can Sam protect the elephants and save the project or will she have to choose? 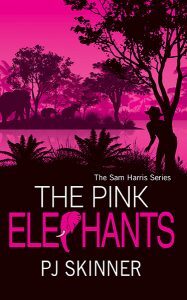 The Pink Elephants is a classic adventure with a strong female protagonist, exotic locations and a dash of humour.